Archipelago Charcoal Rose Diffuser has a beautiful pink glass filled with the dark and mysterious fragrance blend of Fresh Rose Petals, Subtle Charcoal, and Mandarin Peel. 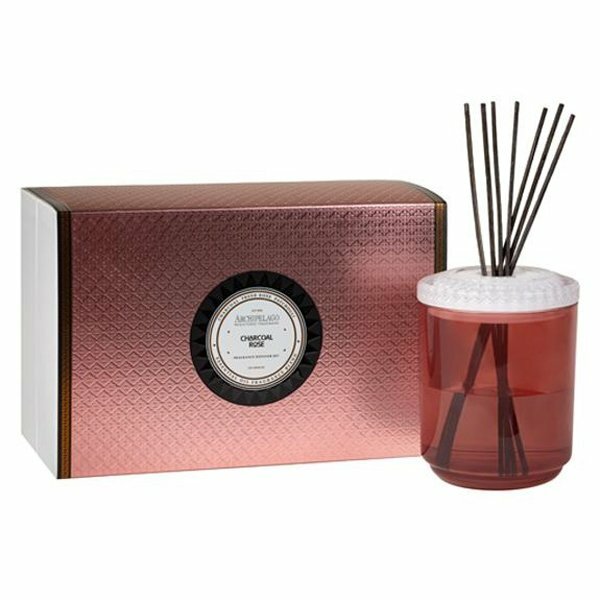 With its elegant cut glass topper and dark reeds, this diffuser will immerse your space with months of bold fragrance. Each diffuser comes with a set of reeds and is packaged in a beautiful gift box. Archipelago's Couleur Diffuser Gift Sets will add a decorative touch and fill the home with an enduring fragrance. Insert the reeds into the open bottle and the reeds will permeate the scent throughout the room for several months.